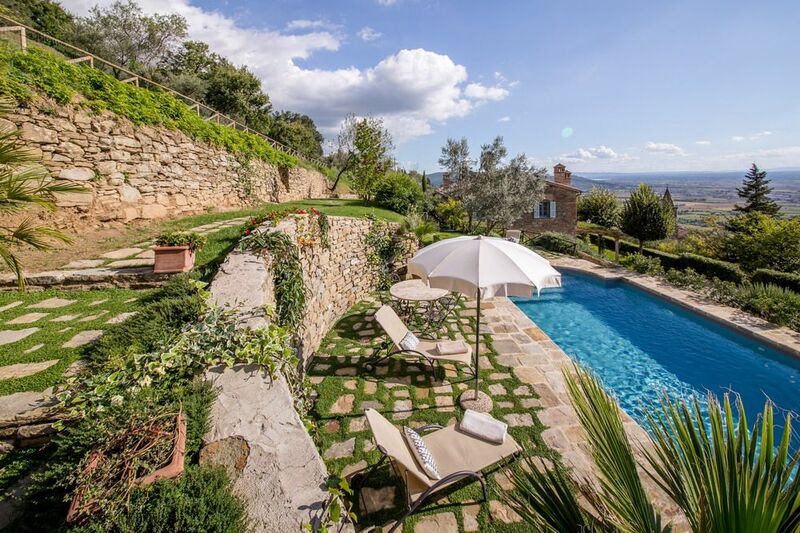 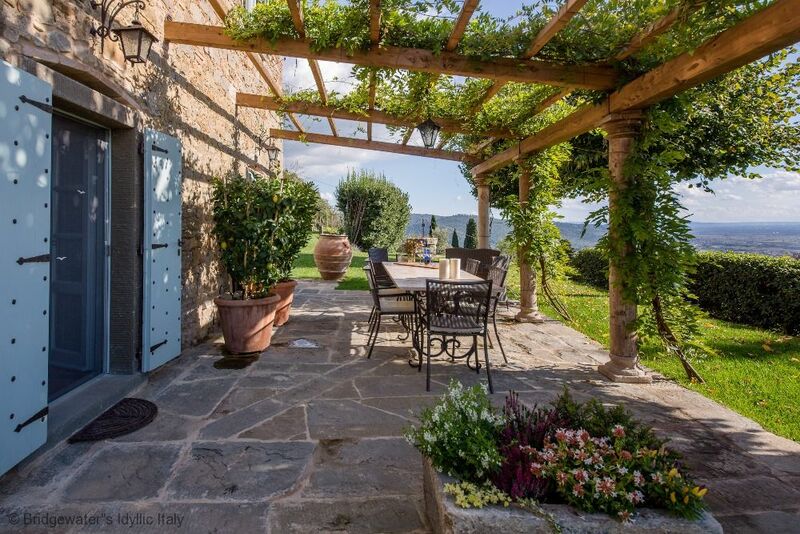 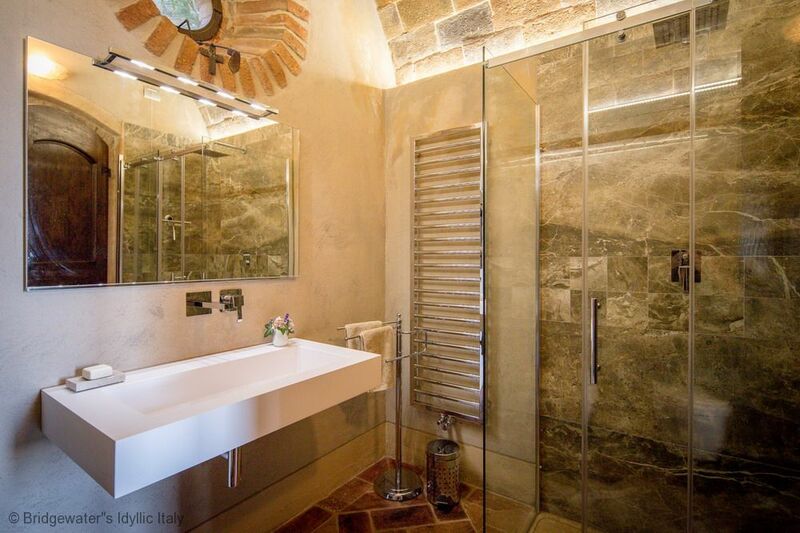 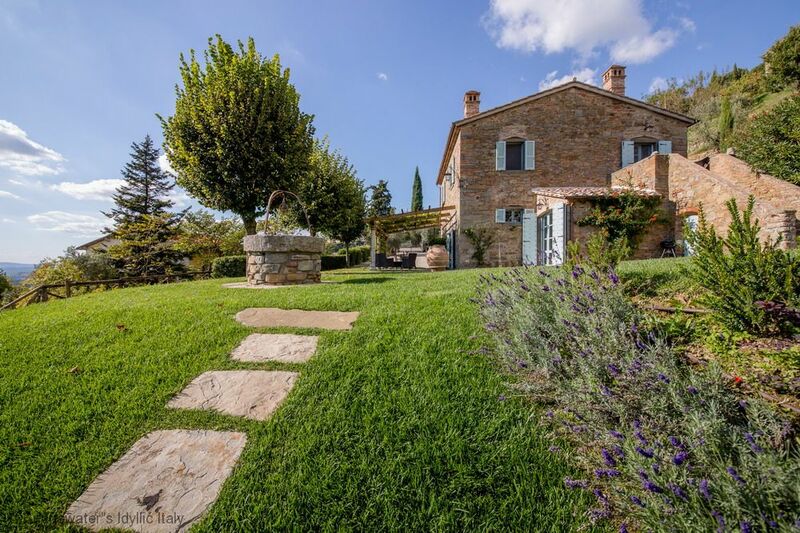 Situated in a highly sought after location only ten minutes on foot from the centre of Cortona! 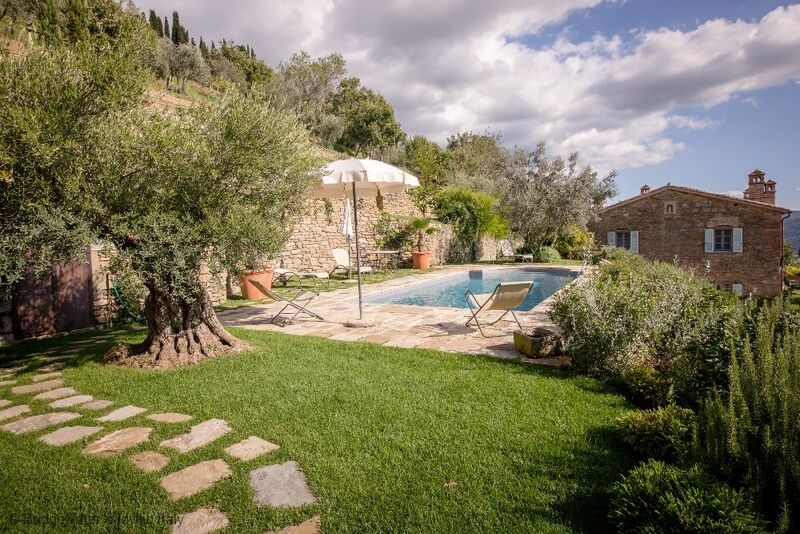 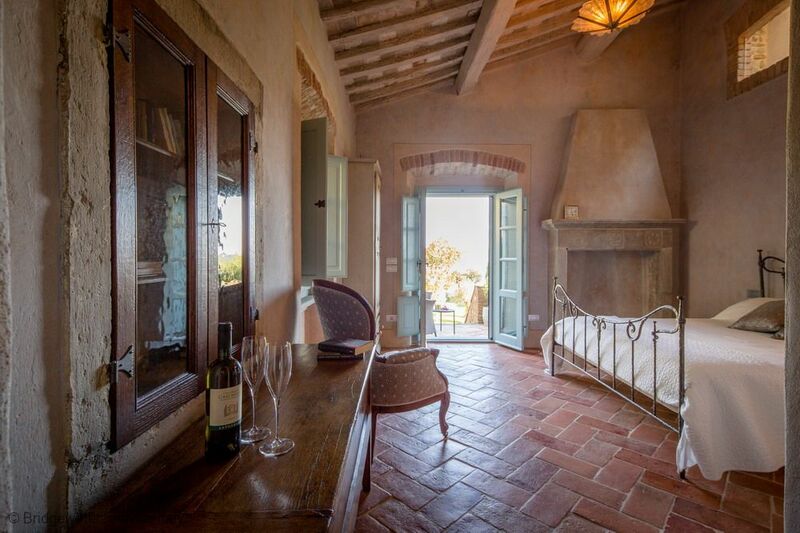 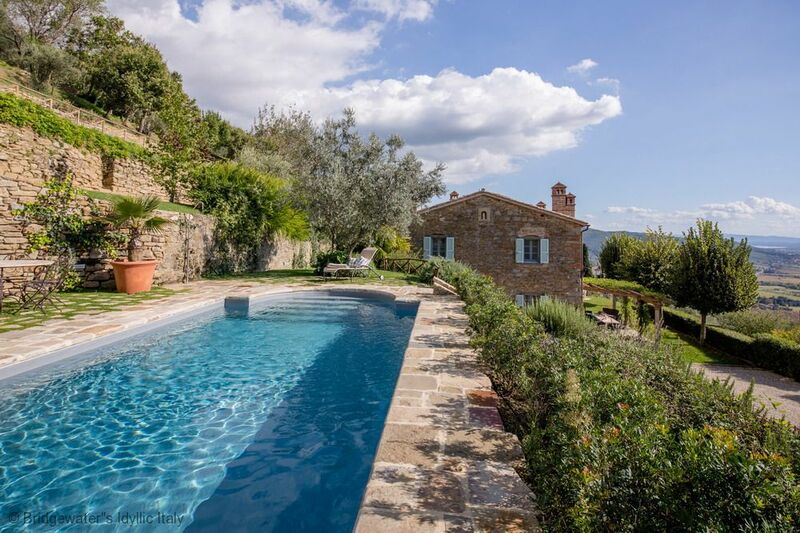 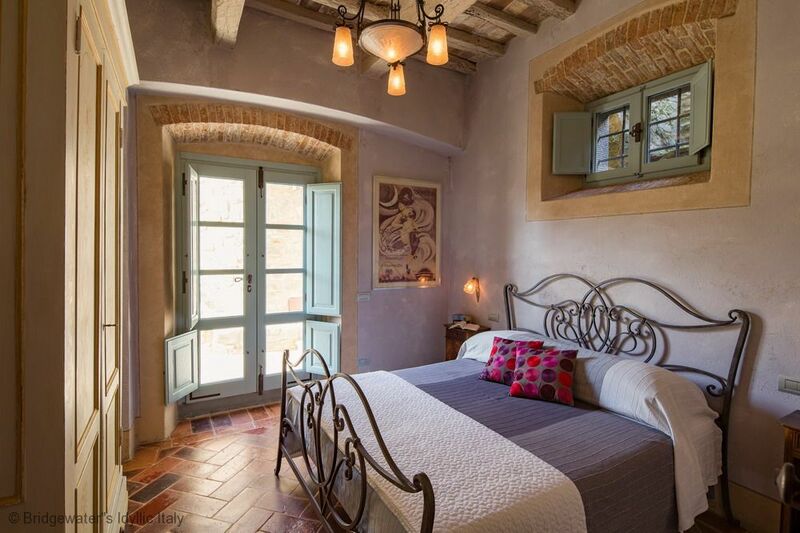 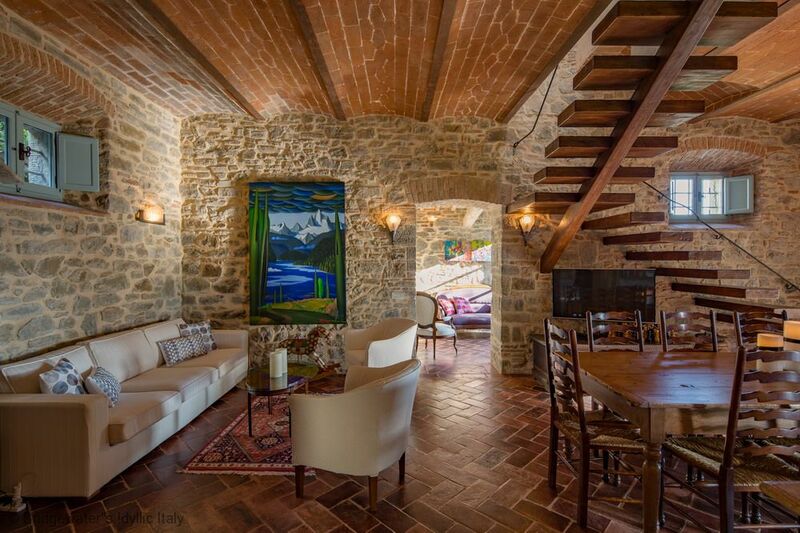 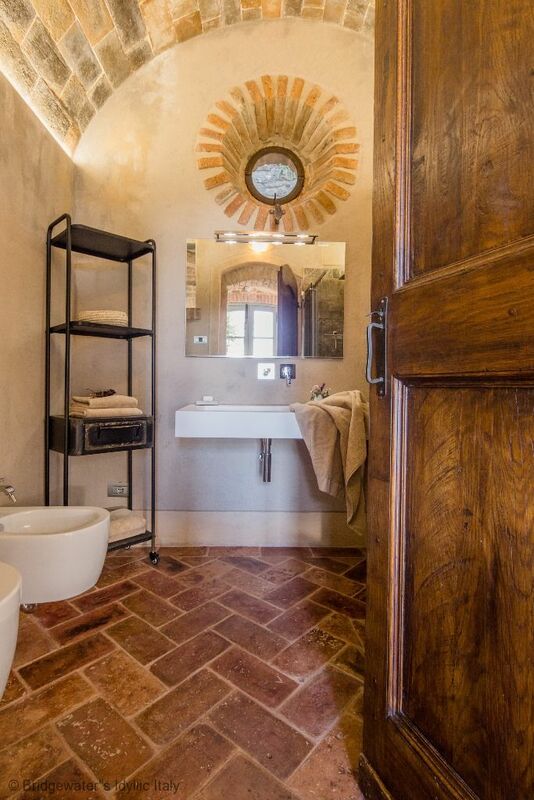 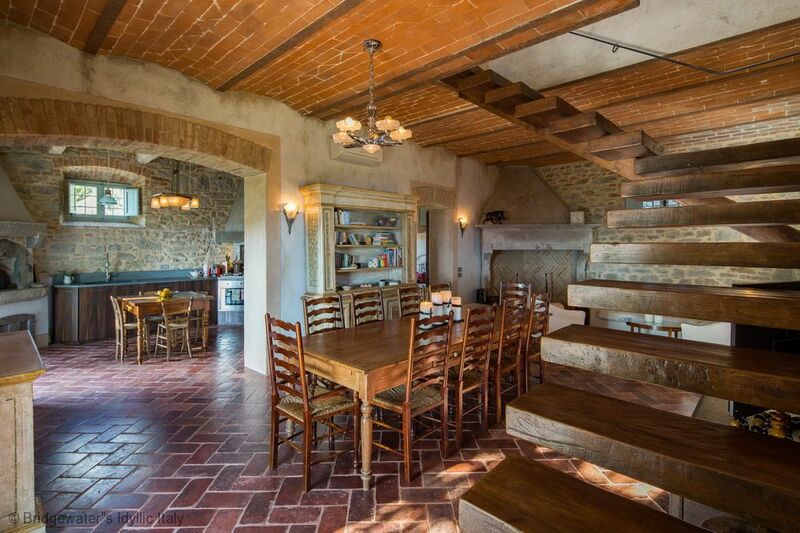 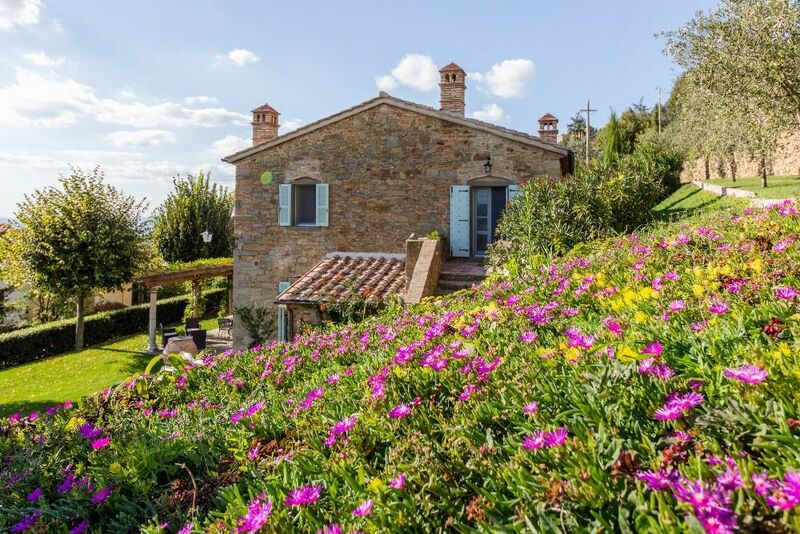 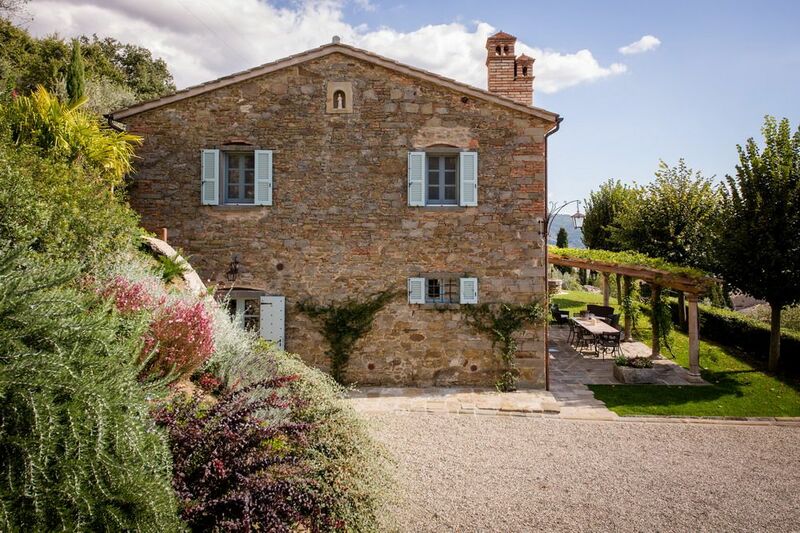 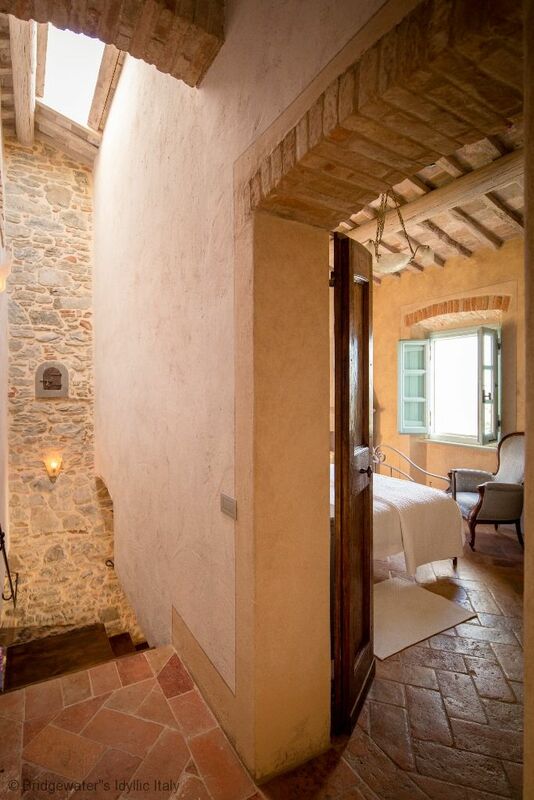 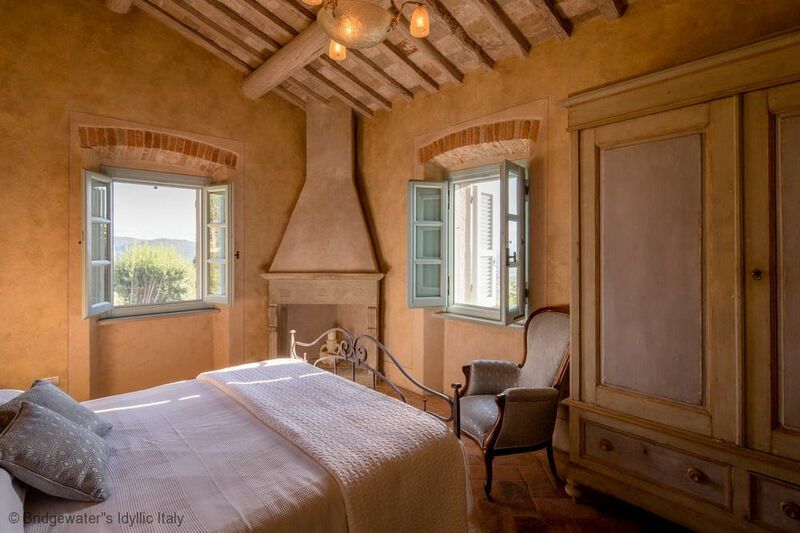 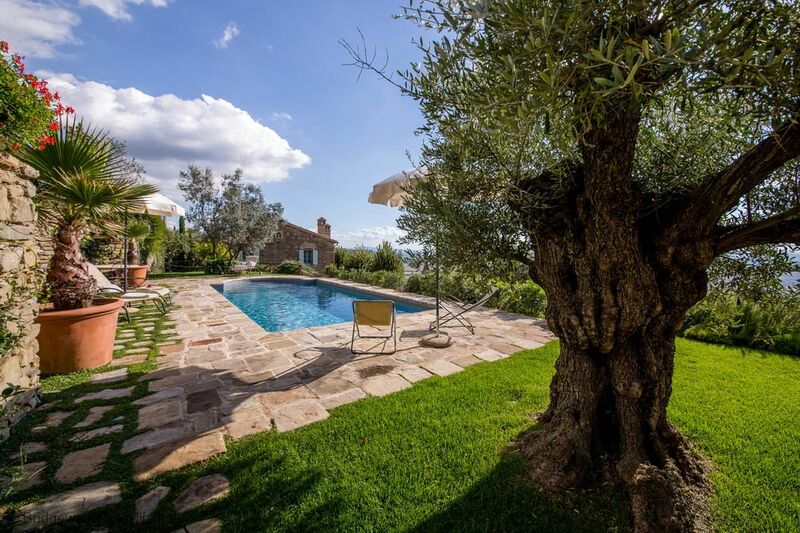 This wonderful stonebuilt farmhouse is surrounded by olive groves and vineyards and offers breathtaking views of Cortona's skyline The property originally dates back to the 17th century and was sympathetically restored in 2015 to offer a high standard of accommodation with tasteful interiors. 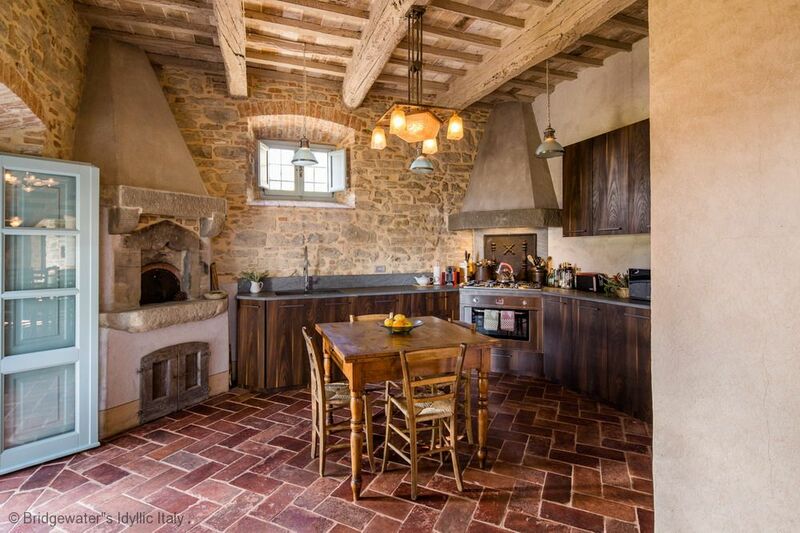 Many original features have been maintained during the such as the 5 metre high brick vaulted ceilings, wooden beamed ceilings upstairs, antique “cotto” floors, ancient carved stone fireplaces and a stone built wood-burning oven in the kitchen. 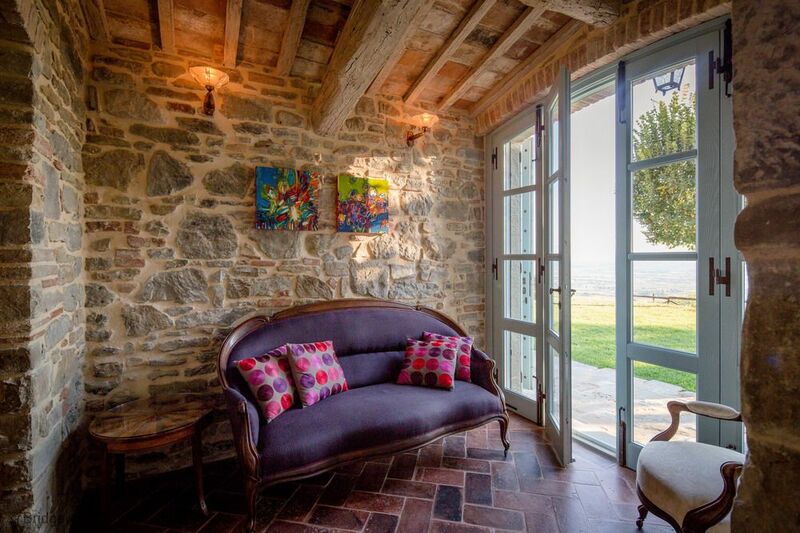 Aircon and wi-fi. 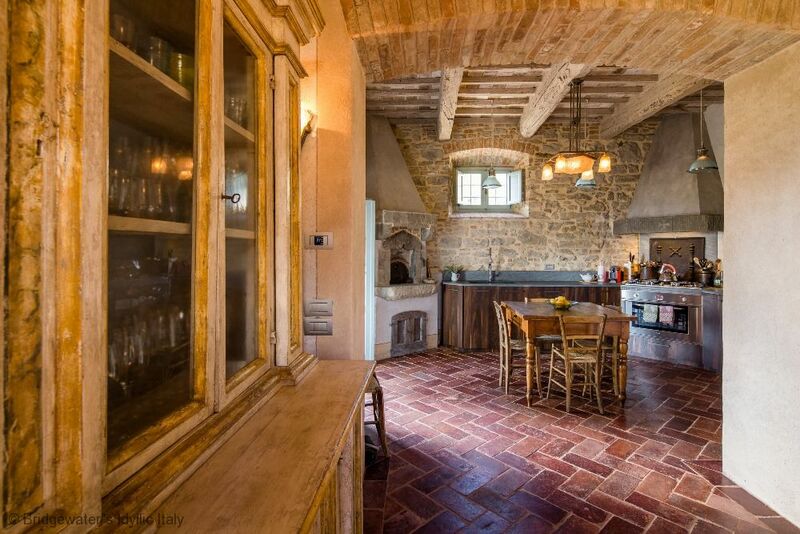 Cook service available. 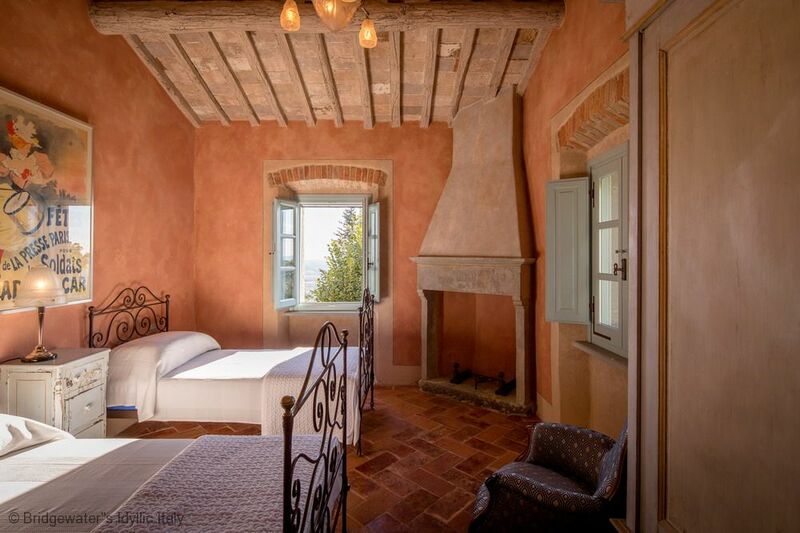 The second floor, reached by an ancient oak cantilevered staircase, is comprised of 3 bedrooms – each with multiple windows streaming dappled sunlight and framing breathtaking views. 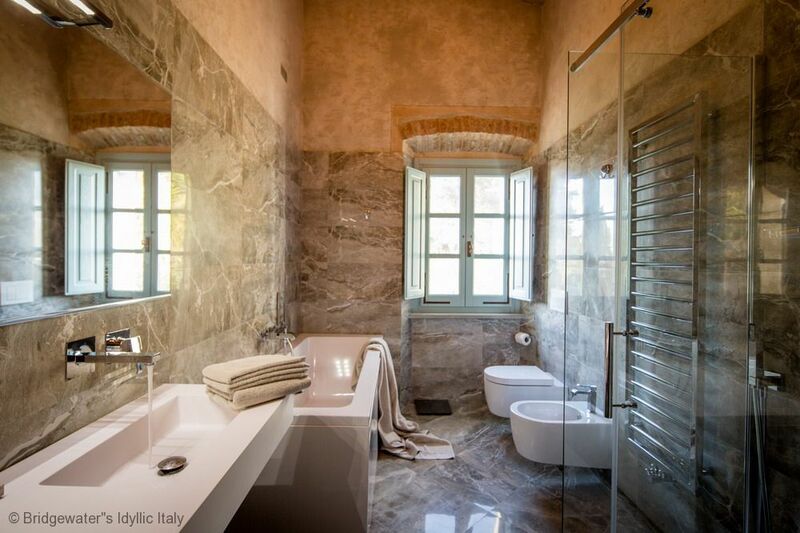 Two bedrooms share a large bathroom with twin sinks, double shower and luxurious bathtub. 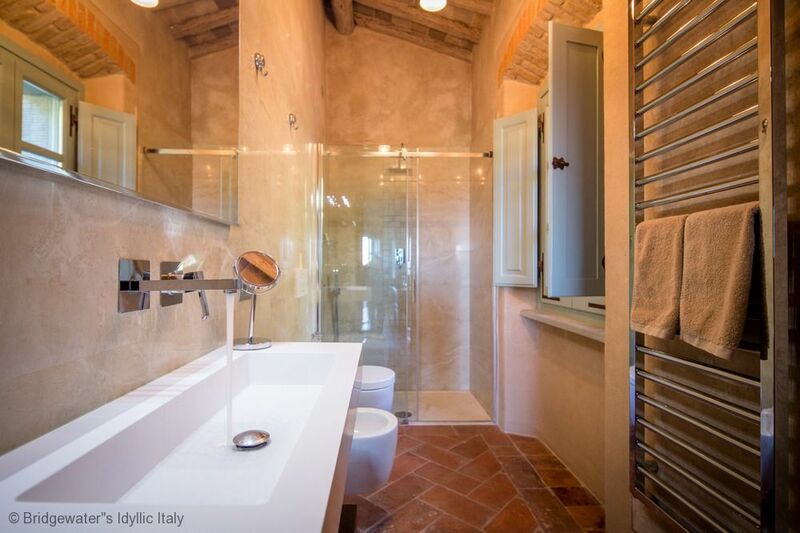 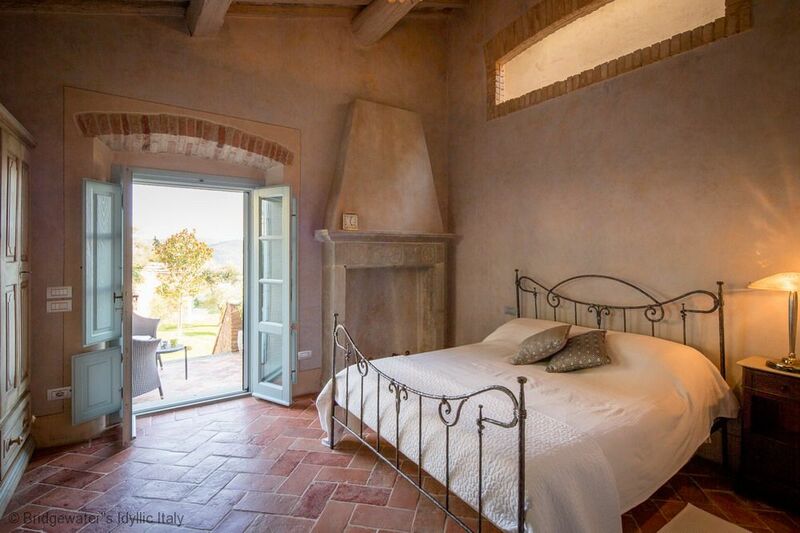 The third bedroom/master-suite boasts an ensuite bathroom with shower and private balcony with expansive views of the gardens, olive groves, Lago Trasimeno and the Val di Chiana. 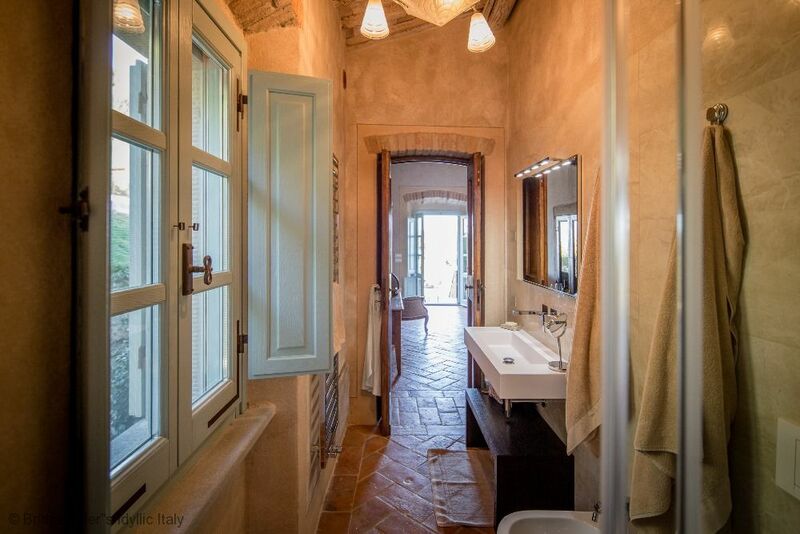 The villa is finished in a sophisticated blend of antique and modern fixtures, furniture and art, including authentic Art Deco lighting throughout, a modern fully equipped gourmet kitchen with professional stainless gas cook top, electric stove, dishwasher and full-sized fridge/freezer, an antique refectory table that can seat up to 16, modern air-conditioning, and in-floor heating. 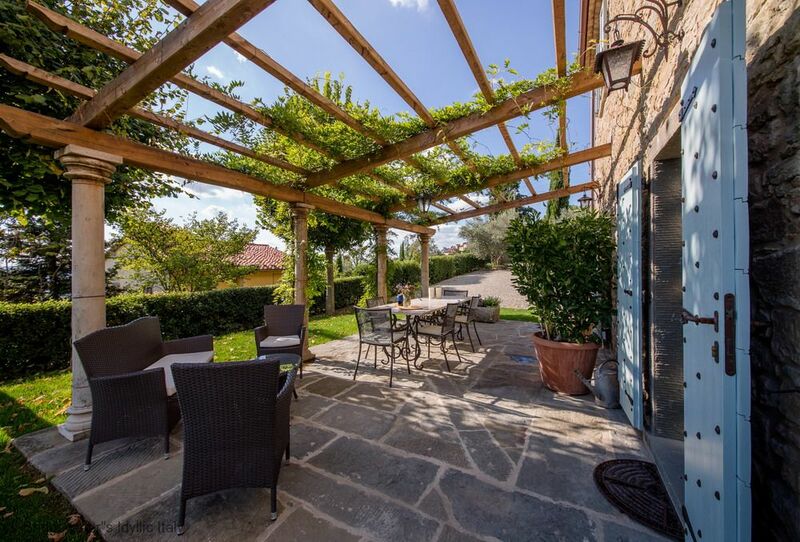 Stepping out of the cool living room or kitchen, the property is embraced by a large medieval stone patio with columned pergola overgrown by violet and white wisteria, shading a dreamy and quintessentially Tuscan outdoor dining and lounge area. 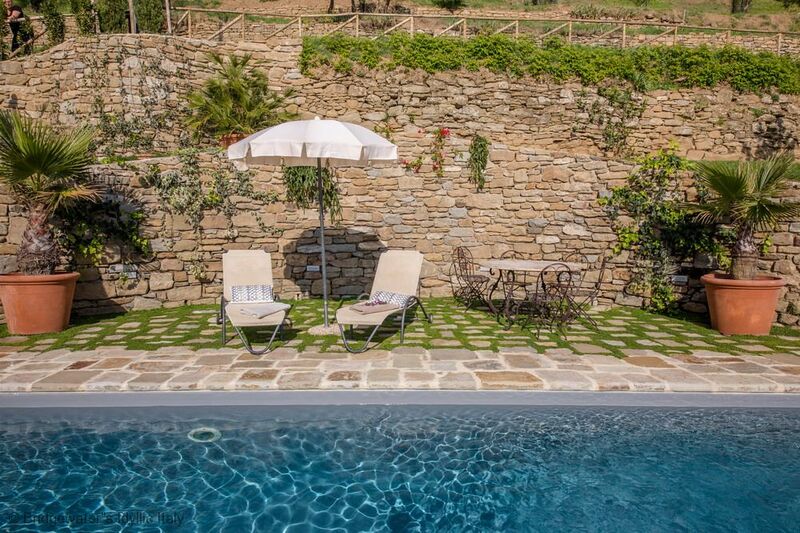 The gardens feature extensive ancient stone pathways and terraced olive groves, a vineyard of Etruscan grapes, and a swimming pool incorporating a swim jet and enveloped by ancient stone pavements. 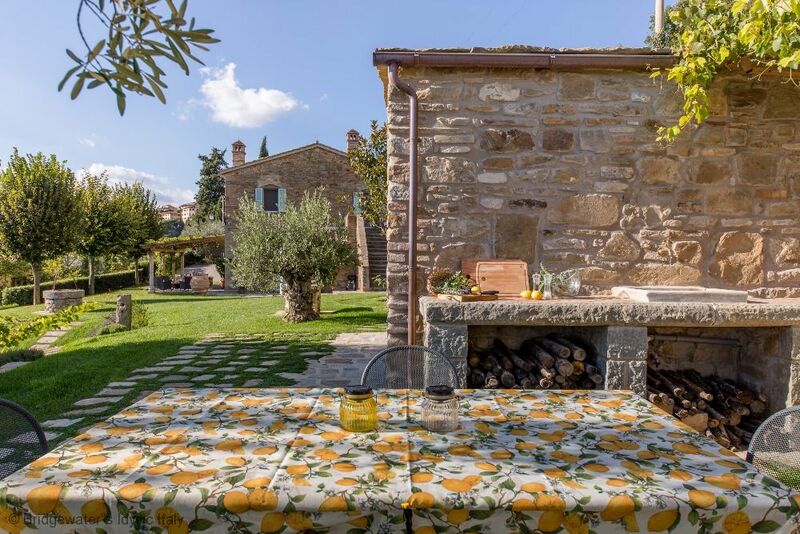 Ensconced in the vineyard, under an 800 year old olive tree, is a stone built outdoor kitchen with wood burning oven, BBQ, medieval marble sink, and dining area, with heart stopping views of Montepulciano, Mount Amiata and Mount Cetona. 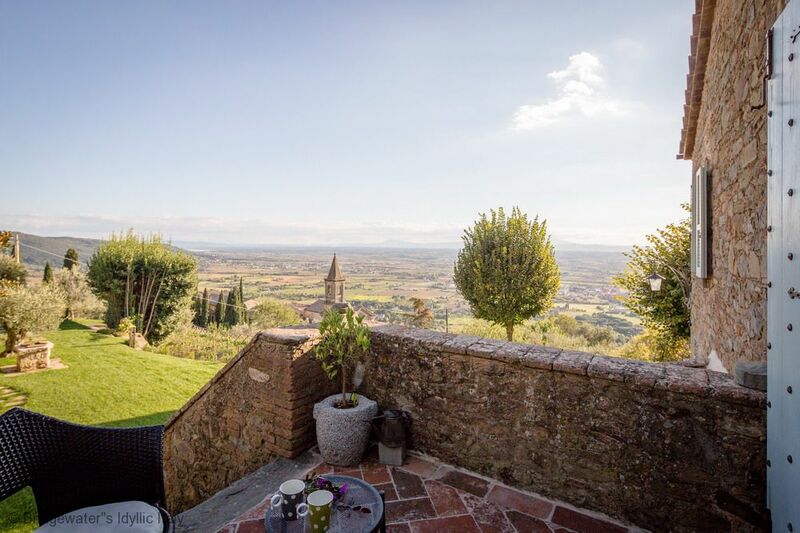 The windows and gardens of Villa Tramonto di Cortona capture early morning sunrises over the hilltops, cooling afternoon breezes rising from Lago Trasimeno, and blazing sunsets backdropping Cortona's ancient skyline. 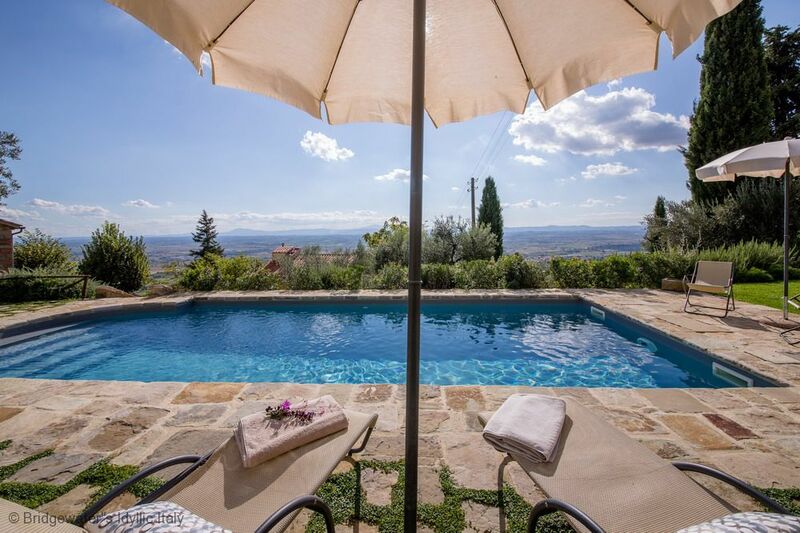 With shops, restaurants, local markets and Cortona's vibrant village life only minutes away by foot, Villa Cristina is a sublime Tuscan paradise in which to experience “la dolce vita”. 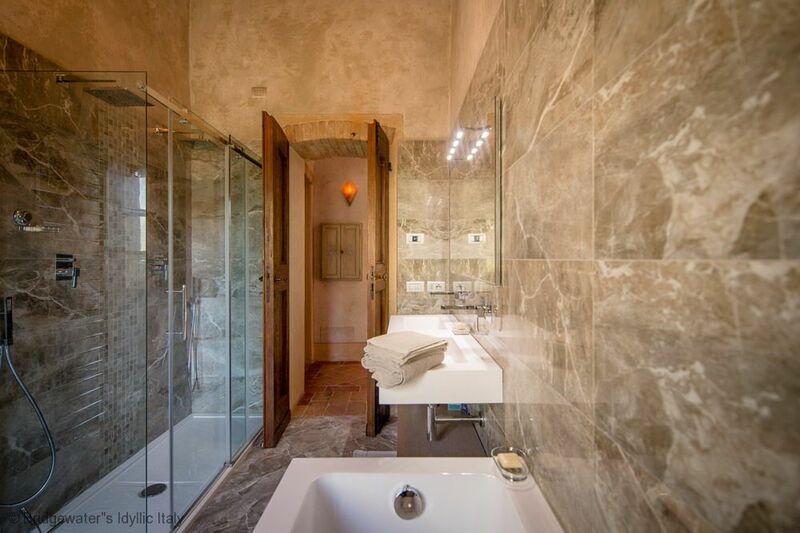 Weekly rental rates are inclusive of power and water consumption, bed and bath linens.